Experience a fast and smooth dry or wet shave. For wet shave, use shaving foam, shaving gel is not recommended as its density and stickiness can hurt performance. Patented design for extra reach to back of head and body. Forehand Glide Shaving provides many reaches by forehand motions. Backhand Glide Shaving provides many reaches by backhand motions. Shaver features large swirling, flexing shaver head with 3 rotary cutters for fast and close shave. This takes the mess out of shaving. Experience no nicks, cuts or burns. 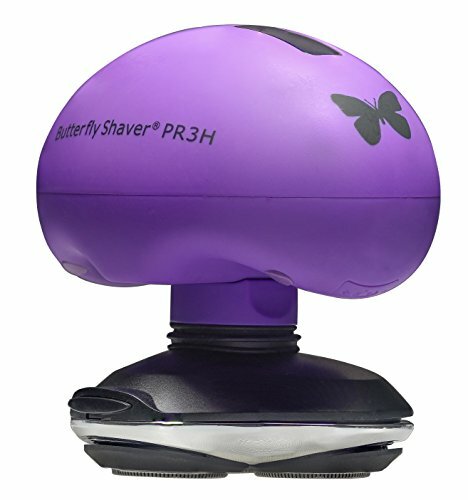 The Butterfly Shaver by Skull Shaver features a small patented hand-held shaver handle that easily fits in the palm of the hand and its shaped horizontally as opposed to the traditional vertical shaver handle. This feature enables the user to shave faster in any direction, including a circular motion. Easy to clean and rinse with warm water without opening shaver heads. Shaver is not for use in bathtub or shower; cordless and corded operation. Outside USA, North American plug may need an adapter. You can find many useful videos on website. Compatible with attachments and accessories sold separately. We are in pursuit of the Perfect Electric Shaver! As always we offer full satisfaction or your money back. View More In Rotary Shavers.